Terra cotta toy carts from the Harappan period site of Nausharo in Baluchistan. Holes along the length of the cart serve to hold wooden side bars and at the center of the cart two of the wooden side bars can be extended below the frame to hold the axle. A long stick inserted into the holes at the end of the cart would have been used to support a yoke. The two wheels were found lying next to the cart frame. 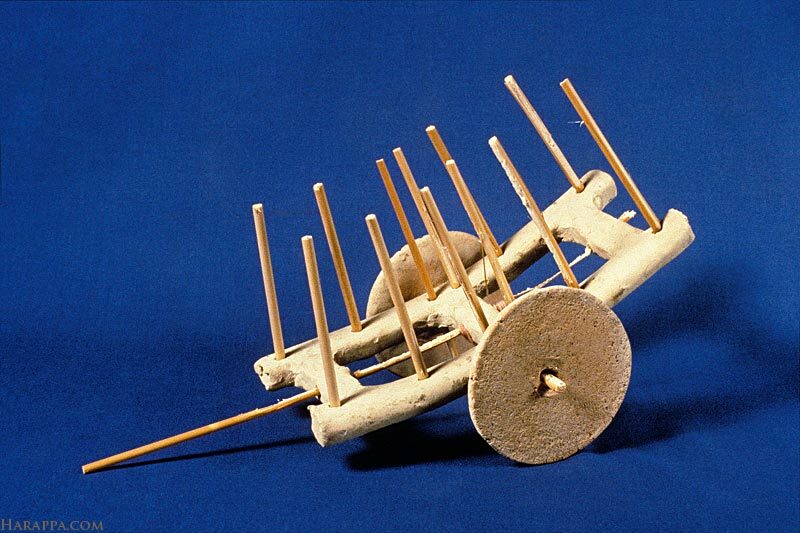 Period III, Harappan, 2300-2200 B. C. Similar carts are still used in rural areas of Pakistan and India (#2).